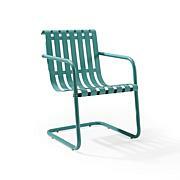 Here's the ultimate enhancement for any backyard retreat, pool area, deck and more. 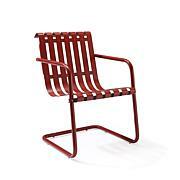 These durable all-weather chairs feature wicker over powder-coated steel frames. 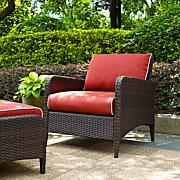 The hand-woven wicker is flexible and fade-resistant, which means it stays like new season after season. 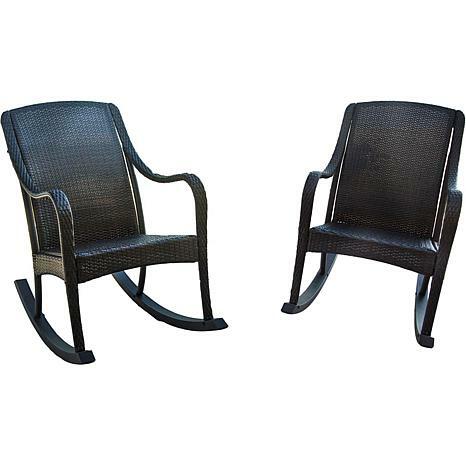 A charming blend of classic elegance and lasting function, this set is just what you need to unwind in style and enjoy the outdoors. The two chairs are on my front porch now, however, it was not so easy to get them there. First, the box was missing a few of the screws so we went to Homedepot and fixed that issue. Being steel frames, the holes did not match up to connect the pieces together. The first chair my husband and I spent about 2 1/2 hours but we did it. The second chair was much harder. I was not strong enough to match the pieces together with the screws so we called one of his friends to help. They both agreed we should disassemble the first chair and return the set. They finally took a step back and took the second chair apart and started over. In the end I love the chairs. 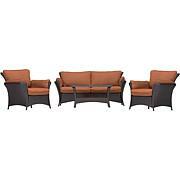 They are sleek, durable and quite nice on my porch. Very frustrating to put together but I do love them now. Comfortable.